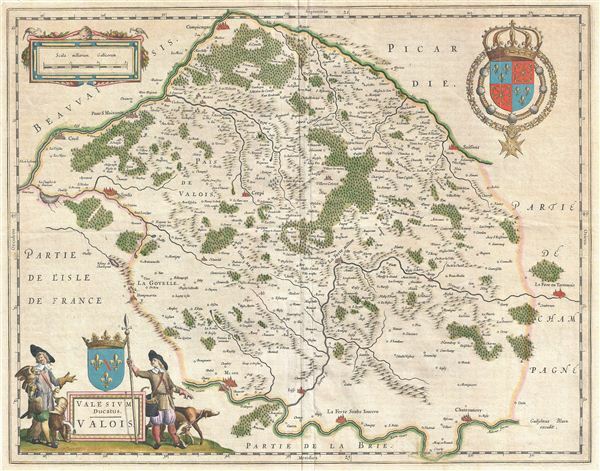 A beautiful c. 1641 Johannes Blaeu map of Valois, France. This region, an ancient French Duchy, is located slightly northeast of Paris and includes the cities of Senlis, Compiegne, Crepy, Soissons, and Meaux. The region is today included in the modern day department of Seine-et-Marne. The region is known for fine wines, including Champagne, which partially overlaps ancient Valois, and France's best Brie Cheese, Brie de Meaux. Three corners of this map decorated with decorative cartouche work, including an ornamental armorial crest, a baroque mile scale, and a title cartouche illustrating hunters armed with spears, falcons, and hunting dogs. Blaeu, W., Atlas Major, (Amsterdam) Latin Edition, 1641. Very good. Original centerfold. French text on verso. Original plate mark visible. Minor verso repair restricted to upper left margin. Margins appear to have been trimmed down at some point, possibly for framing, however, remain ample. Van der Krogt, P., Koeman's Atlantes Neerlandici, 4580:2:231.